I’m Doctor Ariel Warden-Jarrett. I’m one of the board-certified family physicians here at Maryland Primary Care Physicians. Did you know that by the year 2020 depression is projected to be the number two cause of disability in the U.S.? You may also be surprised to know that depression is something that your primary care doctor can effectively treat and help you to overcome. Depression can have many causes. It can begin with a life situation that causes unusual sadness. It can also be a byproduct of hormone imbalances in the brain and other organs. Or it can accompany heart disease and chronic pain. In fact, many chronic health conditions can put you at higher risk for depression – things like MS, diabetes, or a previous heart attack. And the normal response to trauma or loss can also be a trigger. But when sadness leads to a loss of normal functioning, depression may be the diagnosis. And remember, discovering that you might be depressed is not a bad thing. On the contrary, it can be the first step on the path to finding a happier, healthier life for you and your family. Lifestyle is also important – Regular exercise can make a big difference. Getting more exposure to sunlight and fresh air. Listening to music that you enjoy – All of these things can help. And the right diet can also have a big impact on your mood and outlook on life. So, talk to your primary care physician. Take that first step. Together, we can get your balance back, and those “joy bubbles” popping again. You’ll find that you can get plenty of help from the doctor you already know and trust. For more information, contact Maryland Primary Care Physicians. 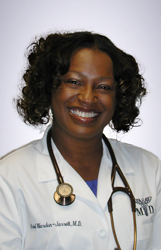 Dr. Warden-Jarrett is a Maryland Primary Care Physicians, LLC partner and is certified by the American Board of Family Medicine. She sees patients in the Bowie office.